Kansas personal property is classified by the Kansas Constitution, and interpreted by PVD (Property Valuation Department). PVD dictates to all counties how Kansas personal property is to be valued for taxation. 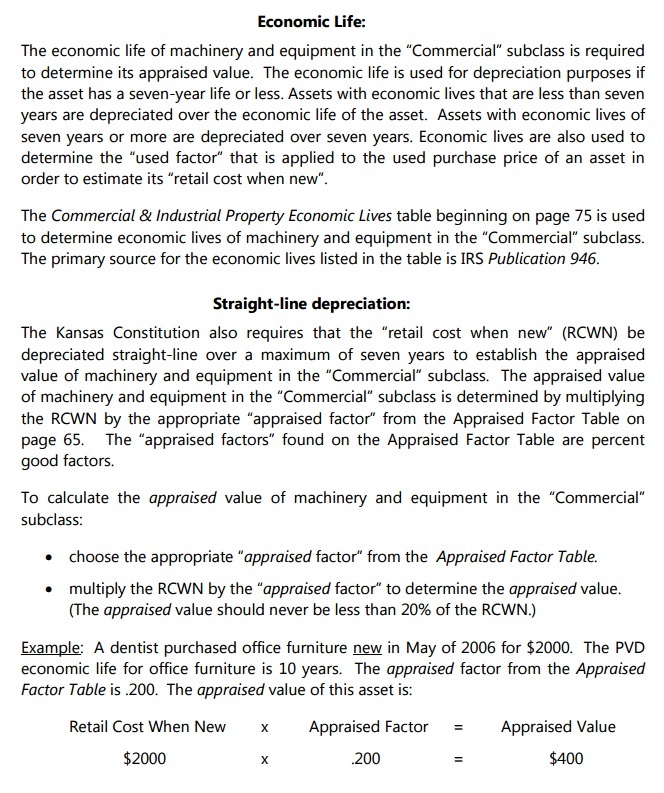 PVD prescribes specific valuation guides for all Kansas county personal property appraisers to use. In general the guides direct the appraiser toward a market value on the various items (vehicles, watercraft, aircraft, mopeds, ATV’s etc.) and that market value is multiplied by the prescribed percentage (partial assessment by Kansas Statutes) to arrive at an “assessed” taxable amount. This assessed amount is taken and multiplied by the mill levy for your taxing district (city or township) to arrive at your yearly tax bill. **Beyond the scope of this publication. Contact the county appraiser’s office for more information. ***State-assessed and beyond the scope of this publication. Information in this publication does not apply to state-assessed property. ****This classification is only applicable to non-highway titled motor vehicles and motor vehicles operated over 20,000 pounds on public roads. 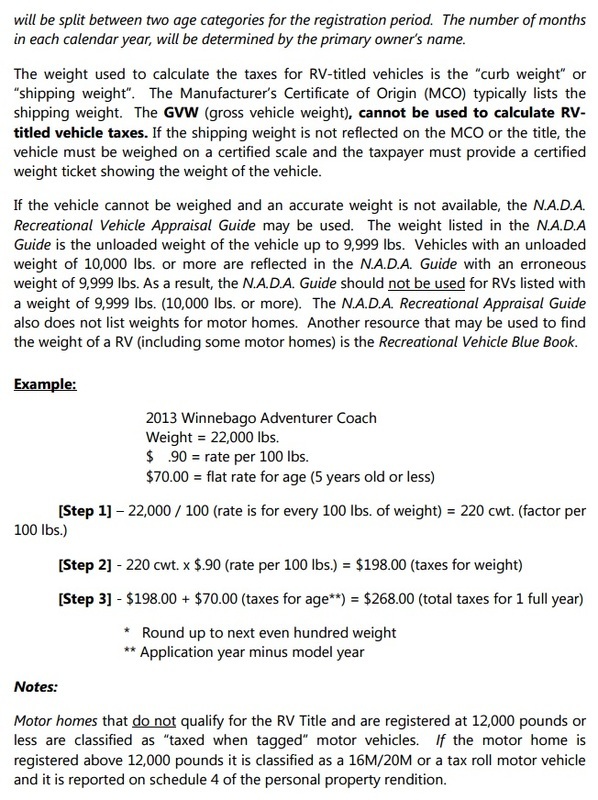 Motor vehicles operated under 20,000 pounds on public roads and "recreational vehicles" are appraised, assessed and taxed pursuant to statue (KSA 79-5l00 series). Everyone with personal property is to list and report it to the County Appraiser’s office by March 15th of each year. The owner or his relative should sign and affirm that the listing of property is accurate. The signed list is then valued (as prescribed by PVD) and placed on the tax roll for that particular year. A bill will follow in late November for the first half payment due by December 20th of each year. KSA 79-303 states "Every person, association, company, or corporation who owns or holds, subject to his or her control, any taxable personal property is required by law to list the property for assessment." A Minor His or Her Father; if not living or unsound, then His or Her Mother; if neither living, by the person In charge of the property. The Rendition list of property should be signed and returned to the County Appraiser’s Office. This list is referred to as an Assessment form, and our office staff is capable of assisting the property owner in filing this Assessment Rendition. The County Appraiser’s office is required to assign a penalty (by State Statutes) for late filings, so we encourage all personal property owners to file by March 15th of each year. Any specific questions can be asked via phone 620-724-6431, or by visiting our office on first floor of the Crawford County Courthouse in Girard, Kansas. One of the more recent, taxpayer friendly changes to personal property states that “Machinery and Equipment” purchased after July 1st 2006 is expressly Exempt from taxation, or personal property assessment. This was done to make Kansas a more friendly work State for business owners. In addition to the above mentioned change, Kansas watercraft by item (boat, motor or trailer) with a purchase cost of $750.00 or less are also expressly exempt. This does apply to a couple other areas, so if you have any questions please call the Crawford County Appraiser’s Office (620-724-6431) between 8:30 am – 4:30 pm Monday through Friday and we will be most willing to assist you. Motorcycles, automobiles and trucks that are tagged to operate at 20,000 pounds or less on public roads are appraised for tax purposes using a formula set forth in laws. The motor vehicles approximate base wholesale price (dealer cost) when first sold to the public is used to "classify" the vehicle within a price range. The mid-point of this price range is then reduced 15% per calendar year (K.S.A. 79-1500 series). Motor vehicles operating over 20,000 pounds or non-highway motor vehicles, are appraised at market value. The market value is generally obtained using valuation publications prescribed by the state. Automobiles owned and leased for a period of time not exceeding 28 days by a car rental company have an excise rental tax imposed in lieu of a property tax (K.S.A. 79-5117). Motor vehicles used by for hire motor carriers over the road to transport persons or property are state-assessed. Contact the Motor Carrier Section of the Kansas Division of Property Valuation for more information regarding property taxes on state-assessed motor vehicles (913) 296-2365. What is commercial and industrial machinery and equipment? The term commercial and industrial machinery and equipment includes tangible personal property that is used to produce income or is depreciated or expensed for IRS purposes such as office furniture and fixtures. The Kansas Constitution provides that commercial and industrial personal property will be appraised starting at its "retail cost when new" and depreciated straight line over a maximum of seven years. If the economic life of the machinery or equipment is less than seven years, it will be depreciated straight line over the shorter life. However, so long as the property is "being used," the appraised value shall not be less than 20% of the retail cost when new of such property. This classification of property is assessed at 25%. 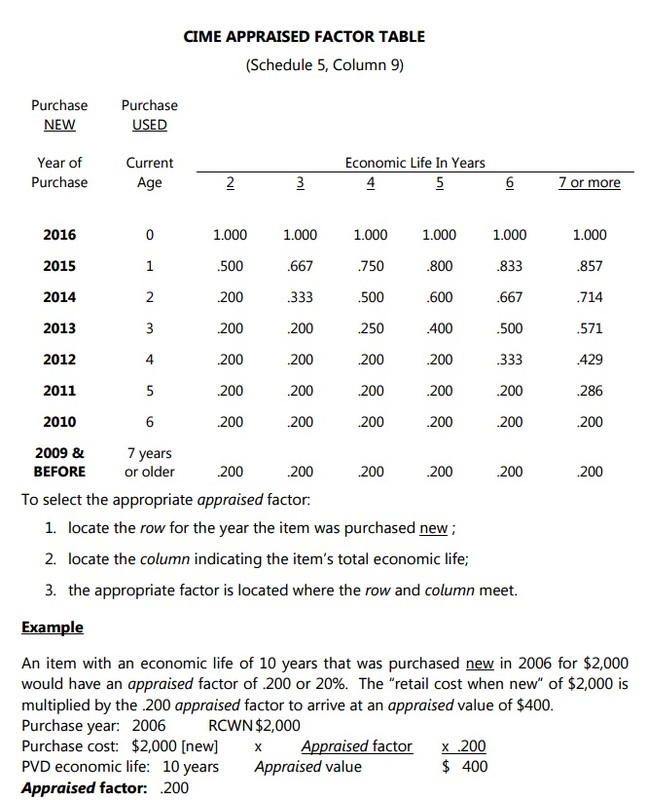 "Retail cost when new" means the dollar amount an item would cost when new to a purchaser at the retail level of trade. It is not a used sale price, and it is not a wholesale or manufacturer’s cost. It is the total cost a taxpayer incurs to acquire new property and place it in operation in order to use it to produce income over a period of years in a commercial or industrial setting. The term "retail cost when new" does not include sales tax or freight and installation charges that are separate and readily discernible from the set retail price. If a taxpayer cannot determine the retail cost when new of a used item from a reliable source, the county appraiser will estimate the retail cost when new using the used sales price of the item and a formula prescribed by the state. The county appraiser will determine the economic lives of the assets listed on a rendition. Economic lives are based primarily upon IRS publication 946 class lives. Contact the county appraiser’s office for questions regarding economic lives of commercial and industrial machinery and equipment. Commercial and industrial property should be considered as "being used" until the property’s condition and other objective evidence clearly indicate that it is no longer used and will never again be used and will never again be used in an income producing capacity. For further interpretation of what constitutes being used, contact the county appraiser’s office. Items used exclusively for business purposes or in certain nonprofit entities are exempt from taxation if the retail cost when new of the item is $250 or less. An "item’ for purposes of the $250 exemption is generally going to be an "item" as it is reported on the rendition. However, if a line item consists of a group of like kind goods that can be used independently, the line item is actually several items. For example, "6 new chairs at $100 each" consists of 6 items qualifying for exemption. On the other hand, an asset that must be used in conjunction with other goods in order to serve its purpose is not an "item". Rather, it is only part of an "item". For example, if a taxpayer lists a "computer keyboard" as a line-item on the rendition, the line-item does not constitute an entire "item". The computer keyboard cannot serve its purpose without the remainder of the computer system; therefore, the keyboard is part of a computer system. The computer system is the item. The keyboard and its other components, even though they may be separately identified and listed, are merely parts of an item for purposes of the $250 exemption. "Items" of commercial and industrial property with a retail cost when new of $250 or less are not required by law to be reported to the county appraiser. However, if you list all your commercial property without eliminating these exempt items from your list, the county appraiser will exempt them from taxation. In fact, your county appraiser may ask taxpayers to continue to list these exempt items for informational purposes, this does not mean these exempt items will be taxed. Also refer to instructions on the back of Schedule 5 of the rendition and/or contact the county appraisers office for more information. 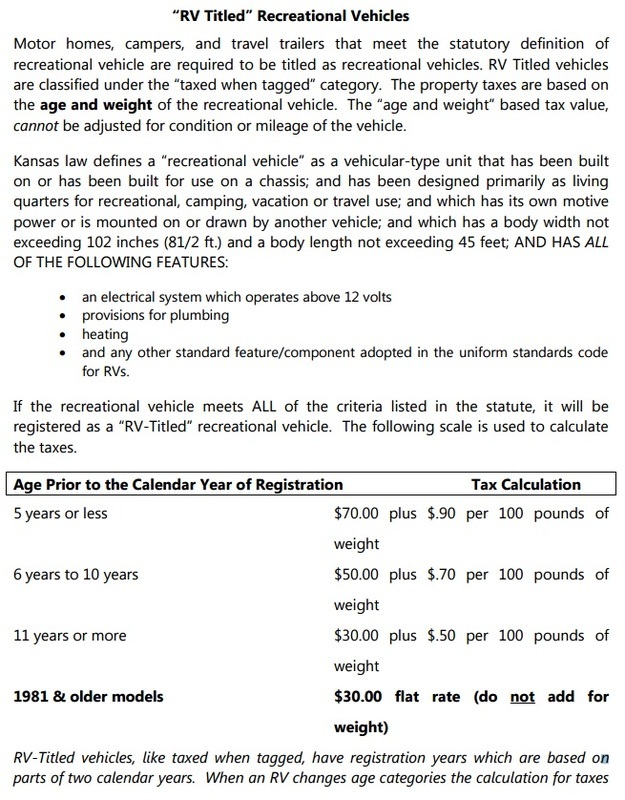 To fall under the tax definition of an "RV" the vehicle must be, among other things, for use on a chassis and designed as living quarters for recreational, camping, vacation or travel use; have a body width not exceeding 8 � feet and a body length not exceeding 45 feet; an electrical system which operates above 12 volts and provisions for plumbing and heating. Please contact the county appraisers office for proper classification.